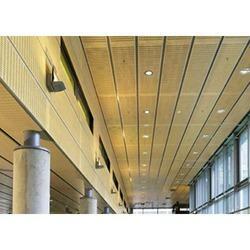 Keeping track of the latest industry developments, we are engaged in offering an exclusive assortment of Acoustical Wall Panels. Our skilled professionals manufacture these products using the finest quality material and advanced tools & equipment. Our quality experts examine these products under certain parameters in order to ensure that we deliver only the best quality products to our clients. Available at reasonable prices, the offered products are widely used in industrial companies, ware houses, factories and workshops. 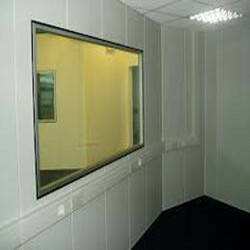 With our rich industry experience, we manufacture and supply an extensive range of Acoustic Window that is used in professional studios. Our offered window is designed and developed in adherence with industry standards using supreme class components and cutting edge technology. Moreover, this window is available in different technical specifications and can be designed as per the specific requirements of the customers. Sound Proof booths are prepared according to customized requirements. These booth are designed for proper balance between absorptio and reverb time. 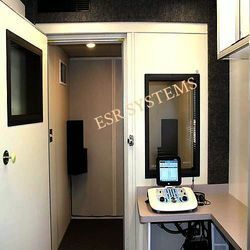 Booth are designed for different purposes like recording booth, audiology booth, machine testing booth, noise test chamber etc. Accordingly the material is used for tapping low, mid and high freqeuncy . Aesthetics is also kept into consideration while design of boot. Size vary according to single person, double person or multi person booth.